Well, this wall was inspired by so many other walls here on MT. So often, I see walls where people make the entire landscape just using brushes, and it always amazes me. So, I gave it a try. Although, I kinda cheated, since the grass was used with a special brush. The rest of the background was created only using the brush, and smudge and blur tool. I think the sky came out nice, but I'm not too sure about the mountains, I may redo those, although, that took me the longest time. Orginally, I wanted to have the two on a trainstation, but it seemed too hard to create, so I gave that one up. U have great brush skills and the color u picked just awesome. The whol bg look like the real things ^_^ awesome. Jus one thing the scan is a bit separated from the bg. This prob (in my opinion) cos the different softness in the bg and the scan. But this doesn't change the fact this is a good wall ^_^. I love it. Not only is FMA one of my favorite animes at the time being. The wallpaper looks good as well. Very clean looking. I really like the tranquil setting and as others have already said your brush work on those mountains was superb. The the scan could use a bit of gaussian blurring and overlaying to help blend it in but besides that nice work. wow the bg is very nice ^^. The scenary is very real. Ohhh, soooo pretty, I wish I could that with brusheds but I'm pretty sure I don't have the talent. Never get tired of Fullmetal Alchemist wallpapers and I love the simple title you chose for it. The clouds and mountains look awesome. But I think there should be some sort of shadows by Ed and Al, so it looks like they are really 'in' then scene, they look alittle out of it in a way. Great job though. ohh, very lovely, I like the grass, everything is so soft and pleasing on the eyes, + fav. Thanks. I like this bg a lot, went straight to the desktop, one of my fave FMA wallpapers. really nice picture... it is awesome picture...of elric brothers..............it has a really nice impression for the all viewers. wow nice picture and Good Work on Mountains and grass, it´s too real to me. And combine perfectly with Ed and Al. Humm I think I missed this one when if came out. opps. XD I saw this picture and I was thinking of walling it, but this is much nicer then what I was picturing. ^^ I love those hills in the background, and the sky just rocks!! Wonderful job! cool wallie, i like the colors! 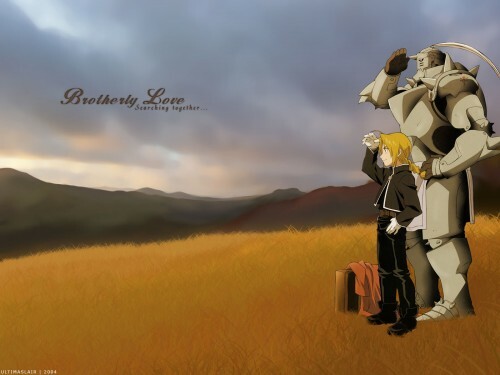 Edward and Alphonse look so cute as they always do! great job! It’s not nice, it's great! Even though so some photo shopped together pictures can look really good; it's more amazing when the artist puts in their own drawing skills. Nice Wallpaper of the Elrics that's looks like they traveled to Iraq or something. Heheh. Edward-"looks like we traveled a bit to far." wow i love the landscape! it's very spacious, so it suits the scan very well. great work! It really looks like they're staring off into the distance. i like that landscape.